In Yoruba culture, parents aren’t called by their first names. Rather, they’re referred to as the mother or father of their firstborn – so in my mother’s case, Iya Lopè. Her approach to cooking has always been to create quick and easy dishes. When I was younger, we would go to the local video store on a Saturday night and choose a film to watch. When we got home, she would find whatever spices she could and create seasoning for chicken drumsticks to eat as we watched. No matter what she added, they were always so appetizing. She said her secret was to add lemon juice to the marinade, but I suspect there’s more to it than that. 1. Preheat the oven to 210ºC/Gas 6–7 and line a baking tray with baking paper. 2. In a small bowl, mix together the shrimp paste, tamarind paste, lemon juice, onion and garlic granules, paprika, celery salt and cumin. Add the herbs to the marinade and taste for salt and cayenne pepper. 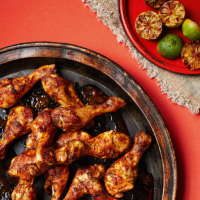 Place the drumsticks into a large bowl and toss through the marinade. Once the chicken is well coated, place on to the baking tray and bake in the oven for 30–35 minutes, flipping over halfway. 3. When the chicken is well browned, and when pierced the juices run clear, sprinkle with parsley and enjoy while hot. If you have the patience, wait 5 minutes to allow the chicken to rest before digging in.